Line muffin pans with paper liners or spray with nonstick cooking spray (2 1/2 inch; 12 count). In a large bowl, beat butter and sugar until light and fluffy. Beat in egg substitute. Stir in ginger and lemon peel. In a small bowl, combine yogurt and baking soda; mixture will bubble. Add to batter, 1/3 at a time, beating well after each addition. Fill muffin cups three fourths full. 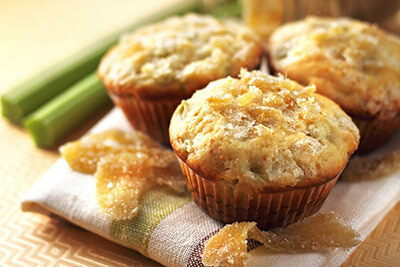 In a small bowl mix turbinado sugar and crystallized ginger; sprinkle over muffins.